For the extinct cephalopod genus, see Andesites. Andesite ( /ˈændɪsaɪt/ or /ˈændɪzaɪt/) is an extrusive igneous, volcanic rock, of intermediate composition, with aphanitic to porphyritic texture. In a general sense, it is the intermediate type between basalt and rhyolite, and ranges from 57 to 63% silicon dioxide (SiO2) as illustrated in TAS diagrams. The mineral assemblage is typically dominated by plagioclase plus pyroxene or hornblende. Magnetite, zircon, apatite, ilmenite, biotite, and garnet are common accessory minerals. 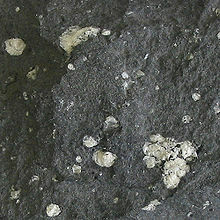 Alkali feldspar may be present in minor amounts. The quartz-feldspar abundances in andesite and other volcanic rocks are illustrated in QAPF diagrams. Classification of andesites may be refined according to the most abundant phenocryst. Example: hornblende-phyric andesite, if hornblende is the principal accessory mineral. Andesite can be considered as the extrusive equivalent of plutonic diorite. Characteristic of subduction zones, andesite represents the dominant rock type in island arcs. The average composition of the continental crust is andesitic. Along with basalts they are a major component of the Martian crust. The name andesite is derived from the Andes mountain range. Magmatism in island arc regions (i.e., active oceanic margins) comes from the interplay of the subducting plate and the mantle wedge, the wedge-shaped region between the subducting and overriding plates. During subduction, the subducted oceanic crust is submitted to increasing pressure and temperature, leading to metamorphism. Hydrous minerals such as amphibole, zeolites, chlorite etc. (which are present in the oceanic lithosphere) dehydrate as they change to more stable, anhydrous forms, releasing water and soluble elements into the overlying wedge of mantle. Fluxing water into the wedge lowers the solidus of the mantle material and causes partial melting. Due to the lower density of the partially molten material, it rises through the wedge until it reaches the lower boundary of the overriding plate. Melts generated in the mantle wedge are of basaltic composition, but they have a distinctive enrichment of soluble elements (e.g. potassium (K), barium (Ba), and lead (Pb)) which are contributed from sediment that lies at the top of the subducting plate. Although there is evidence to suggest that the subducting oceanic crust may also melt during this process, the relative contribution of the three components (crust, sediment, and wedge) to the generated basalts is still a matter of debate. Basalt thus formed can contribute to the formation of andesite through fractional crystallization, partial melting of crust, or magma mixing, all of which are discussed next. Fractional crystallization of a mafic parent magma. Partial melting of crustal material. To achieve andesitic composition via fractional crystallization, a basaltic magma must crystallize specific minerals that are then removed from the melt. This removal can take place in a variety of ways, but most commonly this occurs by crystal settling. The first minerals to crystallize and be removed from a basaltic parent are olivines and amphiboles. These mafic minerals settle out of the magma, forming mafic cumulates. There is geophysical evidence from several arcs that large layers of mafic cumulates lie at the base of the crust. Once these mafic minerals have been removed, the melt no longer has a basaltic composition. The silica content of the residual melt is enriched relative to the starting composition. The iron and magnesium contents are depleted. As this process continues, the melt becomes more and more evolved eventually becoming andesitic. Without continued addition of mafic material, however, the melt will eventually reach a rhyolitic composition. Partially molten basalt in the mantle wedge moves upwards until it reaches the base of the overriding crust. Once there, the basaltic melt can either underplate the crust, creating a layer of molten material at its base, or it can move into the overriding plate in the form of dykes. If it underplates the crust, the basalt can (in theory) cause partial melting of the lower crust due to the transfer of heat and volatiles. Models of heat transfer, however, show that arc basalts emplaced at temperatures 1100–1240 °C cannot provide enough heat to melt lower crustal amphibolite. Basalt can, however, melt pelitic upper crustal material. Andesitic magmas generated in island arcs, therefore, are probably the result of partial melting of the crust. In continental arcs, such as the Andes, magma often pools in the shallow crust creating magma chambers. Magmas in these reservoirs become evolved in composition (dacitic to rhyolitic) through both the process of fractional crystallization and partial melting of the surrounding country rock. Over time as crystallization continues and the system loses heat, these reservoirs cool. In order to remain active, magma chambers must have continued recharge of hot basaltic melt into the system. When this basaltic material mixes with the evolved rhyolitic magma, the composition is returned to andesite, its intermediate phase. In 2009, researchers revealed that andesite was found in two meteorites (numbered GRA 06128 and GRA 06129) that were discovered in the Graves Nunataks icefield during the US Antarctic Search for Meteorites 2006/2007 field season. This possibly points to a new mechanism to generate andesite crust. ^ Rudnick, Roberta L.; Fountain, David M. (1995). "Nature and composition of the continental crust: A lower crustal perspective". Reviews of Geophysics. 33 (3): 267–309. Bibcode:1995RvGeo..33..267R. doi:10.1029/95RG01302. ^ Cousins, Claire R.; Crawford, Ian A. (2011). "Volcano–Ice Interaction as a Microbial Habitat on Earth and Mars". Astrobiology. 11 (7): 695–710. Bibcode:2011AsBio..11..695C. doi:10.1089/ast.2010.0550. PMID 21877914. ^ Petford, Nick; Gallagher, Kerry (2001). "Partial melting of mafic (amphibolitic) lower crust by periodic influx of basaltic magma". Earth and Planetary Science Letters. 193 (3–4): 483–99. Bibcode:2001E&PSL.193..483P. doi:10.1016/S0012-821X(01)00481-2. ^ Annen, C.; Sparks, R.S.J. (2002). "Effects of repetitive emplacement of basaltic intrusions on thermal evolution and melt generation in the crust". Earth and Planetary Science Letters. 203 (3–4): 937–55. Bibcode:2002E&PSL.203..937A. doi:10.1016/S0012-821X(02)00929-9. ^ Reubi, Olivier; Blundy, Jon (2009). "A dearth of intermediate melts at subduction zone volcanoes and the petrogenesis of arc andesites". Nature. 461 (7268): 1269–1273. Bibcode:2009Natur.461.1269R. doi:10.1038/nature08510. PMID 19865169. ^ Day, James M. D.; Ash, Richard D.; Liu, Yang; Bellucci, Jeremy J.; Rumble, Douglas; McDonough, William F.; Walker, Richard J.; Taylor, Lawrence A. (2009). "Early formation of evolved asteroidal crust". Nature. 457 (7226): 179–82. Bibcode:2009Natur.457..179D. doi:10.1038/nature07651. PMID 19129845. Lay summary – Newswise (January 7, 2009).